Leading a sales team is arguably one of the most stressful roles you can have. How can you make growing revenue and enabling your team to succeed easier? 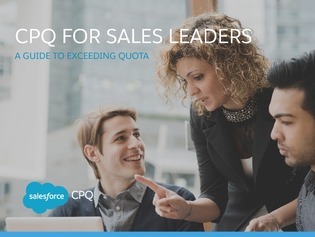 Using an easy configure, price and quote (CPQ) software that integrates with Salesforce can help ensure quotes are accurate the first time. And -- that no money is left on the table. If you choose the right CPQ software that already works with Salesforce, you can expect to see 6 key benefits including improving forecast accuracy. Learn the remaining 5 inside.